You can connect specific lists to your signup forms, so that your new subscribers get placed exactly where you want them. This can also help to categorize and organize your subscribers by where they have signed up. 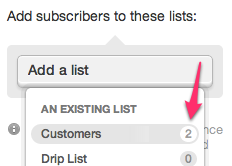 While editing your signup form, click the Add a list menu. Select the subscriber list where you want your new subscribers to go. You can add more than one list, if you'd like. Just click on Add a list again, and select another list. Your list changes are saved, automatically, as you make them. If you don't connect any list, all new subscribers who sign up through this form will be added to the All list, only. If you connect more than one list, those lists will appear as checkbox options on your final form. Find out how to connect the links in your campaigns with your subscriber lists. Find out how to give your readers a choice to stay on one of your lists, when they unsubscribe.